Around The World, Notions Of Beauty Can Be A Real Beast : Parallels In pursuit of beauty, women around the globe subject themselves to complicated and bizarre, not to mention dangerous, procedures. In the West, that can mean going for darker skin. In Africa and parts of Asia, the opposite is the goal. Seriously, a sister just can't win. "Today society accepts the idea of improving one's image," says Dr. Ivo Pitanguy, Brazil's most famous plastic surgeon. 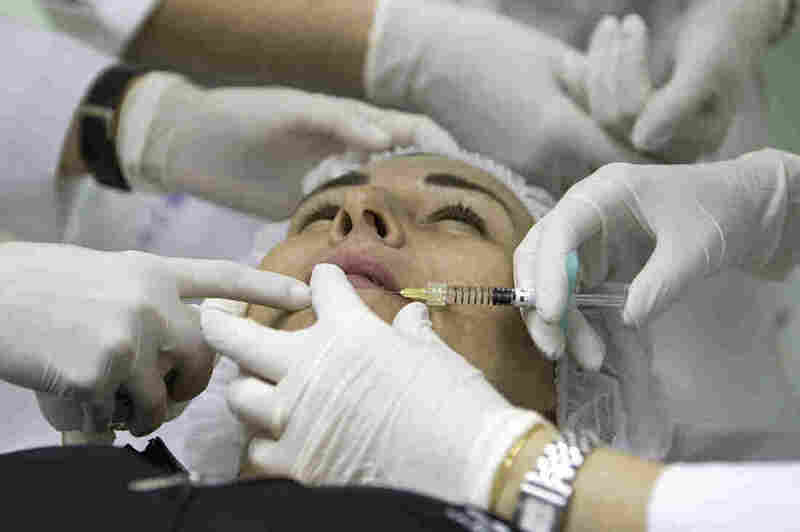 Here a patient receives an injection of hyaluronic acid to plump up her lips at the Brazilian Society for Aesthetic Medicine in Rio de Janeiro in 2008. Chinese-American TV personality Julie Chen reveals she had plastic surgery to make her eyes look less "Asian" to advance her career. Korean women are getting surgeries for permanent smiles. In Venezuela, breast augmentation is so widespread, it's a popular coming-of-age gift for quinceañera, or 15th-birthday celebrations. What century are we in, anyway? Around the world, women continue to go to extreme measures in pursuit of "beauty." That women subject themselves to these complicated and bizarre, not to mention dangerous, procedures got me thinking about these notions of physical beauty — and who gets to define them. And what struck me is the irony that what's considered "beautiful" or desirable in one culture is often the exact opposite in another. Take skin color, for instance. In the West, women expose their skin to harmful radiation and buy self-tanning products in pursuit of skin that's "sun-kissed" and glowing. About a million people hit tanning beds each day in the U.S., according to the American Academy of Dermatology, with nearly 70 percent of them women ages 16 to 29. The market for sunless tanning products is big business, too, with one industry report estimating annual revenue in 2011 at $516 million. 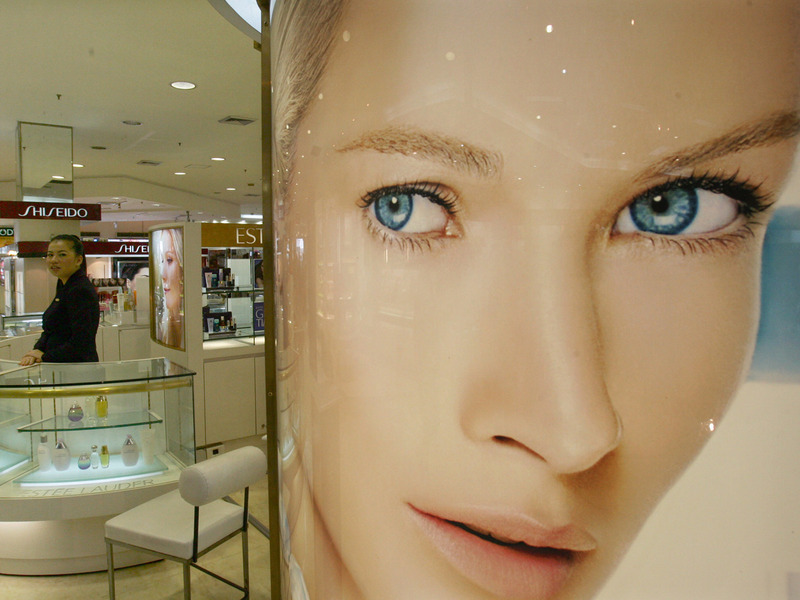 The cosmetics department at a Bangkok store. But for all this money and effort, this very same shade of skin would be viewed in the complete opposite way in some other places — in African, Asian, Latin cultures, you name it. "Aiyah," my Chinese-American mother would scold my younger sister when she was a teen in search of a "savage tan" (thanks, Coppertone). "Too dark." When Nina Davuluri was crowned Miss America in mid-September, commentators immediately noted that she would never have won the Miss India contest because, among other reasons, her skin was too dark. Really, a sister just can't win. And just as the tanning industry caters to Western ideas of beauty, there's a booming business analogue in the rest of the world. In India alone, sales of skin-whitening creams are estimated at $400 million. Mostly they are modern-day snake oils; but in some cases, toxic products have led to serious, long-term damage and even death. This prize of "white skin" is directly related to social status and hierarchies — and the legacy of slavery — around the world. Racial aesthetic politics aren't confined to one country or the other; they're playing out around the world. It's certainly the case in Brazil, one of the largest markets for beauty products in the world — $42 billion in sales last year. It ranks third behind only the U.S. and Japan, according to a recent report by the Brazilian Association of the Cosmetic, Toiletry and Fragrance Industry. Joel Zito Araujo is a Brazilian filmmaker whose most recent work is a documentary called Raca, or Race. "If you turn on the TV today and see a soap opera, you're going to see that blacks aren't even 10 percent of the actors. The people who are valued have Germanic features. If an actor has blond hair and blue eyes, he or she will be more successful. If the actor has black characteristics, she'll probably play a domestic worker, a marginal person," he told NPR's Melissa Block in a recent story looking at race in Brazil, one of the world's most ethnically diverse countries. "As our best-known sociologist says, we are a society divided between the big house and the slave quarters," he said. "People who spent time in the kitchen were the black women." In Brazil, Araujo said, whitening is seen as a sign that a person is moving up in the world. 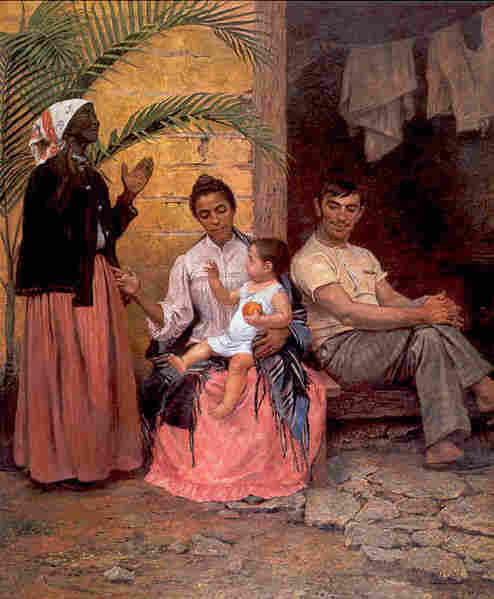 In the interview, he references The Redemption of Ham, a painting showing a mulatto mother sitting with her white husband and holding their child, who's very white — paler than she is. The black grandmother stands behind with her hands raised to the skies. She's praising God that her grandson is white, Araujo explained. And she might use the phrase "cleaning the plantation," he added — when a white man impregnates a black woman. In Latin America in general, the pursuit of beauty through what may seem to an outsider as "any means necessary" is commonplace. No one blinks an eye at elective surgeries, from C-sections to tummy tucks. Plastic surgery is a multibillion-dollar business. "Women get liposuction at 18 and breast reduction at between 16 and 22," Dr. Ivo Pitanguy, a world-famous plastic surgeon in Brazil, told National Geographic in a wide-ranging exploration of The Enigma of Beauty. "They prefer small breasts and big derrieres, whereas Americans want big chests. ... Today society accepts the idea of improving one's image." Julie Chen had surgery to give her "double eyelids" after a news director described her "Asian eyes" as "small" and "heavy" and told her — among other choice comments — that they made her look "disinterested" and "bored" during on-air interviews. In Venezuela, breast implants are so widespread that the late president, Hugo Chavez, publicly railed against them in 2011. This is a place where illegal silicone injections in the buttocks have led to death. And back to the great Julie Chen Eyelid Imbroglio of 2013. "Type a variation of 'almond eyes' or 'almond-shaped eyes' into YouTube's search bar and you'll be bombarded with video tutorials on how to make your eyes nut-shaped with a stick of eyeliner and some eye shadow. (Translation: How to make your eyes seem decidedly more 'Asian' or 'exotic.')" We can save the debate over whether exotic is, in fact, a positive adjective for another day. But you can bet it's not Asian women using those YouTube videos. When I asked a friend in Hong Kong why actresses of Chinese descent whom Westerners consider attractive — say, Zhang Ziyi or Lucy Liu — are, at best, considered average-looking in Asia, her reply was quick and succinct: "You know, Asians always like big eyes, small mouths, white skin." So while white women in America may be using eyeliner and eye shadow to create "Asian" eyes, Julie Chen and countless other women consider their all-natural "Asian" eyes a disadvantage — and are going under the knife to get rid of them.